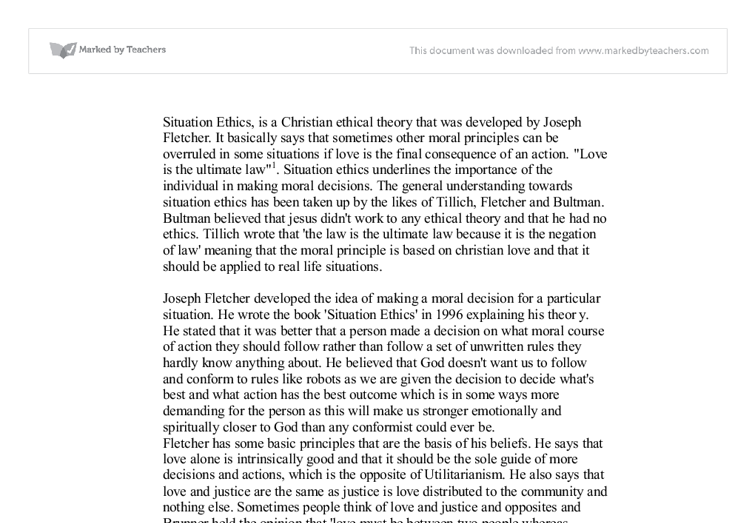 Situation Ethics, is a Christian ethical theory that was developed by Joseph Fletcher. It basically says that sometimes other moral principles can be overruled in some situations if love is the final consequence of an action. "Love is the ultimate law"1. Situation ethics underlines the importance of the individual in making moral decisions. The general understanding towards situation ethics has been taken up by the likes of Tillich, Fletcher and Bultman. Bultman believed that jesus didn't work to any ethical theory and that he had no ethics. Tillich wrote that 'the law is the ultimate law because it is the negation of law' meaning that the moral principle is based on christian love and that it should be applied to real life situations. Joseph Fletcher developed the idea of making a moral decision for a particular situation. He wrote the book 'Situation Ethics' in 1996 explaining his theory. He stated that it was better that a person made a decision on what moral course of action they should follow rather than follow a set of unwritten rules they hardly know anything about. He believed that God doesn't want us to follow and conform to rules like robots as we are given the decision ...read more. Finally, "loves decisions are made situationally, not prescriptively." Fletcher believes that the action isn't wrong unless it hurts someone in the process or in the final outcome. Situation ethics can however have several problems. If someone were to say that it was against the law to steal, a person could say that this is a false statement as if the person was homeless and with two starving children and she stole a loaf of bread, that this would be morally correct as it produces the most love. From this example, it is shown that Situation Ethics can be potentially problematic. People have different views of what love is and there may be times where moral reason demands that something may be done which goes against ones immediate feelings. It is subjective so how do we decide what is the most loving action out of all the possible outcomes. It is also individualistic so Agape (unconditional love) will be destroyed by our selfish desires. It also seems prepared to accept any action if it fits the fact that love was the outcome so that it is regarded as a loving end and could justify actions that many people regard as simply wrong for example, cheating ...read more. 'A man can live his own life, but when he begins deliberately to alter the lives of others, then a real problem arises, on which we cannot simply turn our backs, and in which there is a place for law an the encourager of morality.' 19. Overall it is clear that situation ethics has its advantages especially for individuals as it allows decisions to be made with compassionate and allows judgements to be made with emotions without feeling guilty. Flexibility allows this system to be used for all types of complicated situations and seeks the well-being of others. 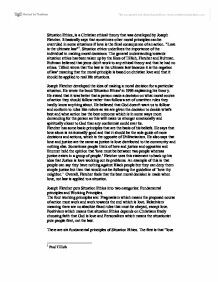 Also situation ethics make an attempt to propose an ethic modelled on the teaching of Jesus and could be considered as a proper Christian ethic. Even after these criticisms Fletcher's moral approach to decision making is still around and applied to decisions. Moreover people everyday people strive daily for freedom to make choices whether or not it is within the border of agape however perhaps the reality that situation ethics paints that moral judgements should be for situations but it is only what could be wish for. 1 Paul Tillich 2 Joseph Fletcher 3 Ethical Theory By Mel Thompson 4 Ethical Theory By Mel Thompson ...read more. This first essay is clearly expressed and, at first, gets the main points about situation ethics mostly correct. It is to be credited for showing knowledge of various thinkers sympathetic to situation ethics. Attempt is made to evaluate situation ethics at significant length. These evaluations are mostly lucidly expressed, though the confusion of the thoughts makes them difficult to understand sometimes. Unfortunately the evaluations of situation ethics are almost all hopelessly mistaken and undermine the sense that the student really understands the theory. The second question is less inaccurate than the previous one, because it relies heavily on quoted material from other critics. Thus it also lacks individual evaluation from the student. This is ironic as the first question would have been more suited to mere quotes and little exposition, whereas this answer requires more evaluation. There is an attempt to offer original views in the conclusion, though these points are largely detached (indeed, at odds with) the claims made in the rest of the argument. Unfortunately, the evaluation that is offered in this conclusion is pretty much nonsense- either irrelevant or internally contradictory. By higher pleasures Mill meant spiritual and intellectual pleasures like reading a book, listening to music etc. And by lower pleasures he means bodily or physical pleasures like eating ice-cream, having a drink etc. Higher pleasures were qualitatively better and more important than lower pleasures. As the truths of Natural law stem from human nature, everyone can gain knowledge of them even without knowledge of God. Aquinas begins with the vague statement of "The good is to be done and pursued and evil is to be avoided" as his first precept. The forms are the perfect models upon which all material objects are based. The form of redness, for example, is red, and all red objects are simply imperfect, impure copies of this perfect form of redness. Ultimately Real, The forms are the ultimately real entities, not material objects. Another issue to consider is that if God is outside space and time then it becomes problematic to talk of God from our position within space and time. Our language is limited by our experience as we know it which means to talk about God who is outside space and time becomes meaningless. Self love and benevolence was above the drives and the ability to reflect was above that. Mistakes made by conscience were not seen as particularly bad to Butler as he believed that we would intuitively know what the right action to take is. Logical positivists only accepted two forms of verifiable language; analytical propositions ( a priori), knowledge is gained through logical reasoning. These definitions are true by definition, e.g. ?all bachelors are unmarried?. We know this to be true because bachelor means that a man is unmarried.